This chapter contributes to the debate on the conceptual differences and disparities in the definitions of social capital among researchers. It also delves into the potential influence of social capital on innovation performance of firms, which continues to fuel its misunderstanding in the literature. The study critically reviews, discusses and presents available literature on the concept of social capital and its subsequent influence on innovation performance. The methodology is an extensive review of available literature on the concepts and the possible link between them. The investigation provides a potential contribution to the debate on the relationship between social capital and innovation performance in firms as a way of direction and attempts to synthesize what academia considers with regard to the concepts and points out potential areas of research required to develop the overall subject area. The chapter offers a resource for practitioners and students in this new field which has attracted the attention of enterprise developers. Among social capital researchers, there is a metaphor that ‘people who do better are somehow better connected’ (Burt, 2001, p.202); even though in social network literature there is no clarity on what is meant by better connected and no clear indications of which network structures really generate new knowledge either (Pickernell et al., 2006; Pittaway et al., 2004). This statement may be supported in a study by Gonzalez-Brambila (2014) which indicates that one of the major direct benefits of social capital is quick and easy access to information; a vital ingredient for doing better. There is also a consensus that social capital is generally a public good and though inherently embedded not within the beneficiaries but between their relations with others (Noran, 2005; Adler and Kwon, 2002; Bourelos et al., 2012). Notably, within the literature, the concept is highly polarised and definitions either see it to be a form of relation that an individual has with other elements of society, it is considered an external phenomenon in network theory and inclined to the egocentric perspective of social network (Chenhall et al., 2010) or focus is on internal structural characteristics of an organization. The purpose of this chapter is to contribute to the debate on the conceptual differences and disparities in the definitions of social capital among researchers. It is also to delve into the potential of social capital on innovation performance of firms, which continues to fuel its misunderstanding in the literature (Adler and Kwon, 2002; Cohen and Fields, 2000; Murphy et al., 2015). 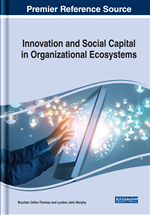 The overall objectives and mission of the chapter are to critically review, discuss and present available literature on the concept of social capital and its subsequent influence on innovation performance of firms. This chapter therefore conducts a literature review that discusses the differences and disparities in the definitions of social capital and its relevance to firm performance. It also analyses social capital and its relation to performance. There is a focus on performance in general and innovation performance in particular. Trust: The belief in the reliability, truth or ability of an employee, firm, or organization. Social Network: Network of personal relationships and social interactions. Innovation Performance: The ability to transform innovation inputs into outputs resulting in innovative market success. Firm: Business organization in the form of a limited company, corporation, or partnership that makes a profit through selling goods or services. Innovation: The implementation of a new idea or method in a firm or organization. Social Capital: Value of networks and social relationships in an organization or firm. Cooperation: Process or action of working with another person, employee, organization, or firm to undertake or accomplish something. Social Relations: Interactions between two or more people, employees, organizations or groups.